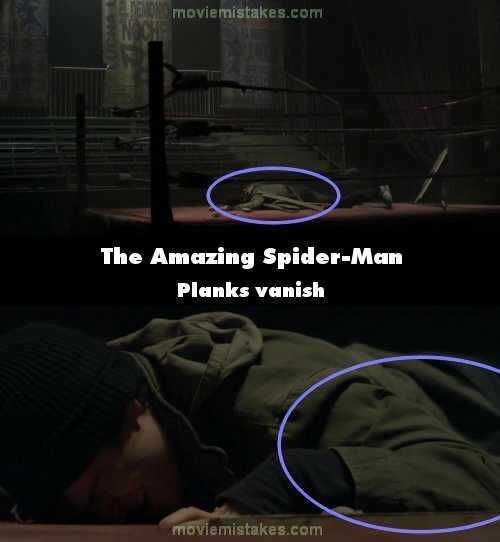 Continuity mistake: When Peter falls through the roof and lands in the wrestling ring, the planks on his body suddenly disappear. Continuity mistake: While fighting against Lizard in the lab, Peter's jacket changes randomly from spotless to covered in dust, to partially covered in dust, back and forth. Continuity mistake: While fighting against the Lizard in the lab, Peter looks at his backpack. The position of its straps and the debris on the wall change between shots. Continuity mistake: When Peter is paying at the convenience store, the bottle on the counter turns around between shots. Continuity mistake: In the scene where the lizard and Spiderman are fighting in the sewers, the lizard scratches Spider-Man's chest, causing tears down the front of his suit and chest. He actually scratches straight down his chest, but from then on, whenever Spiderman's chest is shown the scratches are diagonally across him. Continuity mistake: In the scene where Peter Parker is fighting on a train he tells the last man standing 'not my board', the last man is black but after hitting Parker and the board breaking the next shot is one of the guys he has already knocked down who is white fighting him after the board breaks. Continuity mistake: After Peter leaves home and breaks the glass door, Ben places his hand on May's back. When the angle changes it's on her shoulder. Continuity mistake: During Peter and Lizard's fights by the lockers, watch the folder on the right side behind them. It sometimes faces a 9 o'clock direction, others an 8 o'clock. Continuity mistake: When Lizard launches Peter through a wall into a classroom, books and huge chunks of concrete fly above Peter, but when he lands and slides backwards they're suddenly gone. Continuity mistake: When Peter leaves his house and May asks Ben to "leave him alone" her position swaps from half a meter away from the wall to right next to it, with one hand leaning on the frame. Continuity mistake: When Gwen visits Peter at the end of the movie, you can see that the glass door with the house number "36" painted on it has been replaced from when he broke it earlier in the movie, and it looks brand new. Once she leaves and he turns to Aunt May, the numbers have returned to their earlier weathered and peeling state. Continuity mistake: In the car thief scene, the cop points his gun at Spidey and tells him not to move. Spidey puts his arms in the air with his upper arms relatively horizontal and his forearms straight up. But in the immediate shot following, his upper arms are also straight up. Factual error: There is a scene in midtown Manhattan toward the middle of the film outside a NYC subway station, which according to the sign on the subway entrance is at 6th Avenue and 39th Street. There is no such subway station on those streets. Continuity mistake: When the roof breaks Peter falls feet first facing to the right side. A frame later, he is falling face down facing the left side. Continuity mistake: During the scene where Uncle Ben is talking to Peter in Peter's bedroom, on his desk there is a solved Rubik's cube. Uncle Ben picks it up, and twists it slightly. It then suddenly appears on the opposite side of the desk next to Peter, too far away for Ben to have placed it there, fully solved again. Audio problem: As Dr. Ratha says to Dr. Connors, "The clock is ticking, Dr. Connors", his lips do not match what he says and are still moving shortly after he finishes speaking. 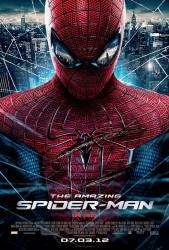 Peter Parker falls through a roof and lands in a wrestling ring, where he gets the idea of using a mask, a homage to the original comic and the first Sam Raimi film, where Peter tests his spider powers by entering a wrestling match.